8:20am Officers are investigating a phone calls complaint in the 600 block of N. Sandusky Ave.
9:52am A verbal dispute in the 1700 block of Marion Rd. was investigated. 10:04am A property owner in the 400 block of W. Rensselaer St. reported a refrigerator taken from the residence. 10:35am A false alarm was received from the 500 block of E. Charles St.
10:47am A false alarm was received from the 900 block of W. Perry St.
10:51am A W. Mansfield St. resident reported her vehicle missing. The vehicle was later returned. 11:20am A report of a disorderly person in the 1200 block of N. Sandusky Ave. was investigated. 12:50pm Officers spoke with subjects on station reference domestic issues. 1:15pm A report of a domestic problem in the 100 block of E. Mansfield St. was investigated. 1:33pm A 9-1-1 hang up call was investigated. 2:18pm An overtime parking complaint in the 1000 block of Wingert St. was checked. 3:26pm A resident in the 600 block of Kaler Ave. claimed assault and the matter was unfounded after both parties were interviewed. 3:33pm A report of subjects playing in the fountain in Millennium Park was investigated. 3:53pm Officers warned a Marion man regarding soliciting without a permit in the Home Circle Dr. area. 4:57pm A Cullen Court resident reported a window on her home damaged. 6:58pm A parking issue in the 600 block of Kaler Ave. was investigated. 7:46pm A false alarm in the 900 block of Hopley Ave. was investigated. 8:16pm Officers conducted a civil stand by at Bucyrus Plaza. 8:19pm A bag of pills found at Lions Field was turned over to officers. 8:40pm Officers assisted a female in the 300 block of S. Sandusky Ave. who was not feeling well. 8:59pm A parking issue at Aumiller Park was investigated and the vehicle involved had moved. 9:29pm A traffic warning was given in the area of S. Sandusky Ave. and Warren St.
9:40pm A noise complaint in the 1500 block of Edgewood Dr. was investigated. 10:35pm A report of a barking dog at Bucyrus Plaza was unfounded. 10:43pm A female reported losing her cell phone at Lions Field. 10:53pm A report of juveniles throwing fireworks in the Whetstone St. area was investigated. 11:33pm A report of juveniles fighting in an alley in the 600 block of S. Sandusky Ave. was investigated. They were found to be playing football. 11:35pm A resident in the 1400 block of Cullen Ave. reported her 17 year old granddaughter walked away from her home refusing to come back. She returned shortly there-after. 11:47pm Officers assisted a State Trooper on a traffic stop on route 4. 12:30am A verbal traffic warning was given in the 300 block of N. Sandusky Ave.
12:32am A report of a suspicious person in the 100 block of S. Poplar St. was investigated. 12:51am A report of a fight near Washington Square was investigated and subjects dispersed. 12:55am A report of dogs left inside a vehicle in the 400 block of Sears St. was investigated. Officers checked all parked vehicles in the area no dogs were found inside any. 1:33am Officers assisted a Crawford County Deputy in the area of N. Sandusky Ave. and E. Mansfield St.
1:40am A report of loud music in the 900 block of Elm St. was investigated. There was no violation of the noise ordinance heard by officers. 1:59am Officers assisted a Crawford County Deputy on a traffic stop in the area of N. Sandusky Ave. and Gaius St.
2:19am Officers assisted a Crawford County Deputy on a traffic stop in the 200 block of S. Sandusky Ave.
2:41am Officers on patrol investigated a suspicious male in the area of E. Lucas St. and S. Walnut St.
2:45am Officers investigated a false alarm in the 700 block of S. Sandusky Ave.
2:51am A report of loud music in the 1300 block of E. Southern Ave. was investigated. 3:40am Officers assisted an intoxicated male in making his way to his residence in the 100 block of W. Mansfield St.
4:01am A report of a subject shooting a gun in the area of Heritage Circle is under investigation. 7:19am Officers did a welfare check in the 200 block of Dudley St.
8:52am Officers investigated a report of a domestic dispute in the 1400 block of Cullen Ave. A subject was provided transport to meet a counselor. 9:40am Officers investigated a report of a disturbance in the 900 block of Hopley St. A subject was waiting for a ride that was on the way from Crestline. 10:14am Officers gave a verbal warning to a man reference trespassing in the Indian Valley area. 10:48am Officers investigated a two car private property accident at Kroger. 11:20am A report of a domestic dispute in the 500 block of S. Sandusky was investigated. 1:03pm Officers investigated a report of a suspicious person in the 1300 block of Monnett St.
1:56pm A noise possible fireworks disturbance in the area of Mansfield and Lane Streets was investigated. 3:09pm A disturbance at Woodbine Apartments was checked. It was dispute involving a subject moving their belongings from a residence. 3:55pm A false alarm in the 400 block of E. Rensselaer Street was investigated. 4:04pm A resident at Woodbine Apartments reported her vehicle vandalized by an ex-boyfriend. 4:21pm Jamie Lester, 32, was arrested on charges of Criminal Damaging. He was issued a summons to appear in court and released. 4:36pm A domestic disturbance in the 500 block of S. East Street was mediated. 5:19pm An audible alarm heard in the area of Victoria Drive was investigated. 5:57pm An abandoned bike found at Circle K was brought to the Police Department. 7:41pm Traffic stop near S. East St. and e. Charles St. Charles Frazier, 44, was arrested on a Crawford County warrant. He was issued a date to appear in court and released. Another passenger in the vehicle was arrested for drug possession. 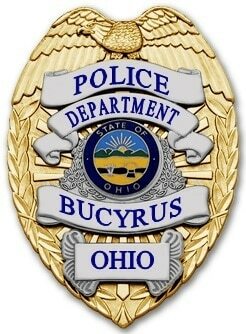 7:46pm A resident of Bucyrus Plaza reported her grandson assaulted by another boy in the complex. Officer met with the parties and the matter was resolved. 8:01pm A false alarm in the 1100 block of Hillcrest Drive was investigated. 8:02pm A resident on Marion Road reported that someone had possibly trespassed into a neighbor’s apartment was unfounded. 8:47pm Officers checked on a report of a loud party in the area of Rogers and Southern Avenue. There was no violation in the area. 8:57pm A disturbance in the 600 block of W. Mansfield Street was unfounded. 9:34pm A report of fireworks in the area of Teddy Avenue was investigated. 9:41pm A verbal warning for fireworks was issued in the 200 block of E. Southern Avenue. 9:48pm A false alarm at Baker Brothers was investigated. 9:59pm A report of fireworks on Lawn Avenue was investigated. 10:01pm A traffic warning was issued in the area of Union and Woodlawn Avenue. 10:10pm A report of fireworks in the area of Penn Avenue was investigated. 10:13pm A report of fireworks in the area of Hopley and Harris Avenue was investigated. 10:14pm A resident in the 1500 block of Hopley Avenue reported someone repeatedly knocking on her door. No one was located in the area. 10:21pm A report of fireworks in the 2000 block of Kerstetter Rd. was investigated. 10:47pm Dustin T. Potter, 27, was arrested for possession of drug abuse instruments and possession of heroin; He was taken to the Crawford County Justice Center to await an appearance in court. 11:05pm A report of a barking dog in the 300 block of Wallace Ave. was investigated. Warning was left at the residence. 11:08pm A report of people yelling in the 600 block of S. Sandusky Ave. was investigated. It was found to be kids playing football in the alley. 11:11pm A report of fireworks in the area of Teddy Ave. and Dudley St. was investigated and a resident in the area was warned. 11:37pm A report of a vehicle with the dome light on in the area of Wise St. and Virginia Ave. No contact at the owner’s residence and officer shut the light off. 12:01am A report of loud music in the 500 block of Failor St. was investigated and the resident was contacted about the complaint. 12:28am Officers assisted a male who had fallen off of his bicycle near the RR overpasses on E. Mansfield St. He was assisted by EMS and officers mediated a domestic issue at the individual’s residence. 12:44am A report of a barking dog in the 200 block of Dudley St. was investigated. 1:20am Officer investigated several reports of loud music in the 500 to 900 block of Plymouth St. Alex J. Lawrence, 31, was arrested for violation of the city noise ordinance. He was issued with a minor misdemeanor citation and released with a pending court appearance. 1:46am A traffic warning was given in the area of S. Spring St. and W. Warren St.
1:52am A traffic warning was given in the area of S. Poplar and W. Oakwood Ave.
2:02am A traffic warning was given in the area of N. Sandusky and Irving St.
3:31am A traffic warning was given in the area of E. Warren St. and S. Walnut St.
3:45am 2 boys, ages 13 and 15, were arrested in the 300 block of S. Lane St. for curfew violation, juvenile possession of tobacco, marijuana drug paraphernalia, and possession of marijuana. They were released to their mothers and will be contacted by Juvenile Court with a date for a court appearance. 11:00am Officers checked the welfare of a man in the 300 block of E. Mansfield St.
12:11pm A person reported being assaulted in the Waterford Glen area. 3:23pm A false alarm was checked at Baker Brothers. 3:51pm A report of a suspicious vehicle on E. Charles St. was investigated. 3:57pm A traffic warning was issued on Marion Rd. 4:33pm A false alarm was investigated on Hillcrest Dr.
4:38pm A report of a custody dispute was made. 5:08pm A report was made of a possible drunk driver on E. Mansfield St. No observation of the reported vehicle entering town. 5:28pm A neighborhood dispute was investigated in the 1600 block of Marion Rd. 5:44pm A juvenile complaint was checked on E. Rensselaer St. and an officer made contact with parent of the children. 6:08pm Officers investigated a person trespassing on the railroad tracks near Highland Av. 7:00pm A two vehicle accident was investigated on Marion Rd. at Southern Av. and a citation was issued. 7:26pm A dispute in the 100 block of Wallace Avenue was mediated. 7:42pm Officers checked on a suspicious vehicle off Wiley Street by the railroad tracks. 7:43pm Officers checked the welfare of an intoxicated man in the 200 block of E. Galen Street. Officer provided assistance escorting him to his residence. 7:52pm A syringe found in the 400 block of E. Mansfield Street was turned over to officers for disposal. 8:32pm A traffic warning was issued in the 900 block of Marion Road. 8:42pm Officers spoke with a resident in the 500 block of Rogers Street about an unruly child. 9:02pm A traffic citation was issued on N. Lane Street for a registration violation. 9:32pm A traffic warning was issued in the area of Rogers and Oakwood Avenue. 9:46pm A report of smoke in the area of W. Irving and Tiffin Street was forwarded to the Fire Department. 9:58pm Assistance was rendered to a subject via Salvation Army. 10:15pm A resident in the 800 block of E. Mansfield Street reported fireworks lit off near their house. 1:09am Officers responded to a domestic violence complaint in the 100 block of W. Mansfield St. Larry Kelly, 26, was arrested on charges of Domestic Violence. He was transported to the Crawford County Justice Center to be held for court. 5:52am A false alarm at Marmon Keystone was investigated. 6:32am A sick raccoon in the 600 block of E. Rensselaer Street was dispatched by officers.